People who are start using a Panasonic P2 digital video camera or a professional Canon camcorder like XF300, XF305, and XF100 may encounter the same problem as quoted above. The only reliable workflow we've found so far is to transcode the .mxf files to Apple ProRes using Aunsoft TransMXF software. Actually, there are numerous converter tools claimed to have the ability of converting P2 MXF to FCP acceptable format, but most of them usually have problems one or another, like complicated operating steps, audio going ahead several seconds before video(the so-called audio and video out of sync issue), choppy/jerky quality while playing, etc. 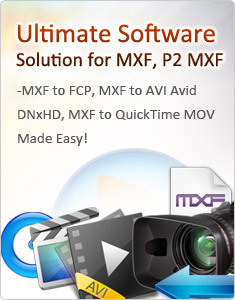 As a reliable MXF to FCP converter tool, Aunsoft TransMXF features straightforward and intuitive interface, excellent output quality with perfect audio and video synchronization, and the most suitable Apple ProRes 422(HQ) settings for FCP, all that make it work well when transcoding MXF videos for further editing with Final Cut Pro. While importing MXF clips to Aunsoft MXF to ProRes converter for conversion, please make sure you have the entire MXF file structure as it saved on your camcorder. If you only have some separate .MXF clips, your files will have image only without audio. See MXF file structure on Panasonic’s P2 card as below. The above screenshot clearly shows .MXF clips are all saved in ‘VIDEO’ folder, while audio files are all stored in ‘AUDIO’ folder. When you importing .MXF clips from the correct file structure, Aunsoft MXF to FCP Converter is able to recognize audio tracks from ‘AUDIO’ folder automatically, which ensures the generated ProRes MOV files have both image and sound correctly. If you are loading some loose .MXF files without the correct file structure, the following window will pop up to show you how to correct your operation. Just do as the instruction says, in that way you are able to load source MXF files successfully. The following interface shows how Aunsoft MXF to FCP Converter works. 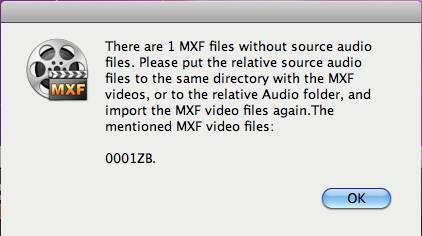 Simply follow it, and you are able to convert MXF clips to FCP workable format easily. Step 1: Click “Add Video” button to load source MXF files. Step 2: Click Format bar to select “Apple ProRes 422(HQ) (*.mov)” as target format for FCP. Step 3: Click “Convert” button to start MXF file conversion. Step 4: Click “Open” button to get the converted files as soon as the conversion is done.